8 Harpoon Block 1C mounted in cannisters, 2 sets of 4. 8 Harpoon Block 2 mounted in cannisters, 2 sets of 4. 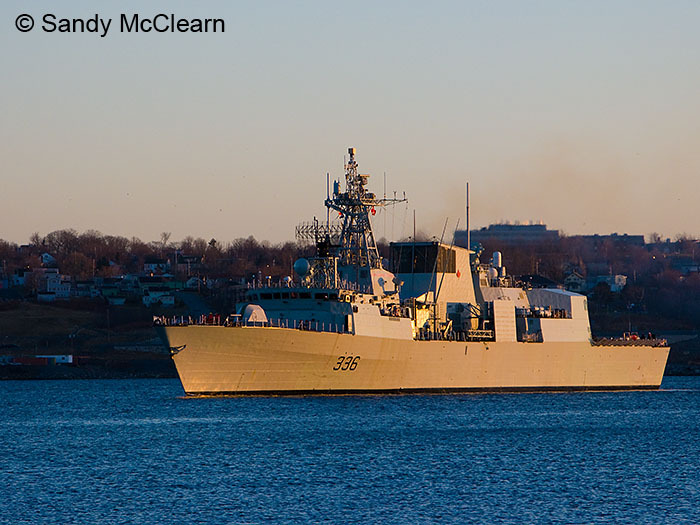 * Not all details regarding Halifax Class Modernization (HCM) / Frigate Life Extension (FELEX) have been finalized, and are subject to change. ** TIAPS was originally to have replaced CANTASS several years ago, but development seems to have been delayed, or possibly abandoned. 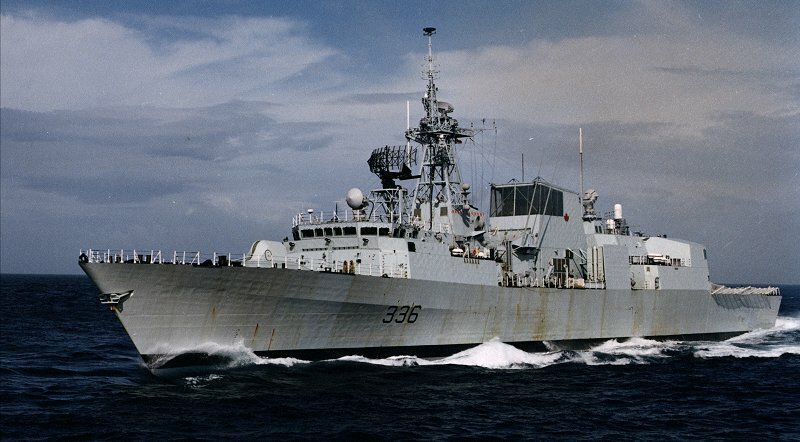 As early as the late 1970's, it was clearly apparent that Canada's aging fleet of ASW destroyer escorts would desperately need replacing in the near future. 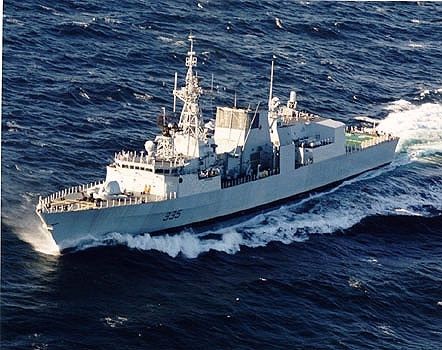 The HALIFAX Class, or Canadian Patrol Frigate (CPF), resulted from this requirement and the first ships started to appear in the early 1990's. 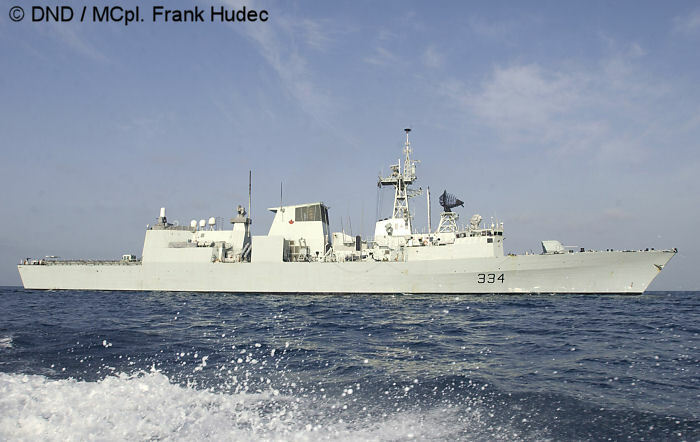 These large multi-purpose frigates are excellent in the heavy seas found in the North Atlantic, and are tailored to Canadian requirements in other respects as well. 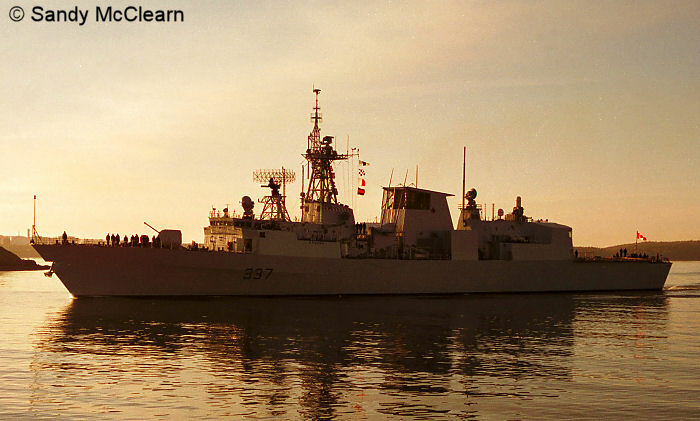 Various members of the class have deployed to the Persian Gulf and Northern Arabian Sea, most recently in support of Operation Apollo and the war against terrorism. 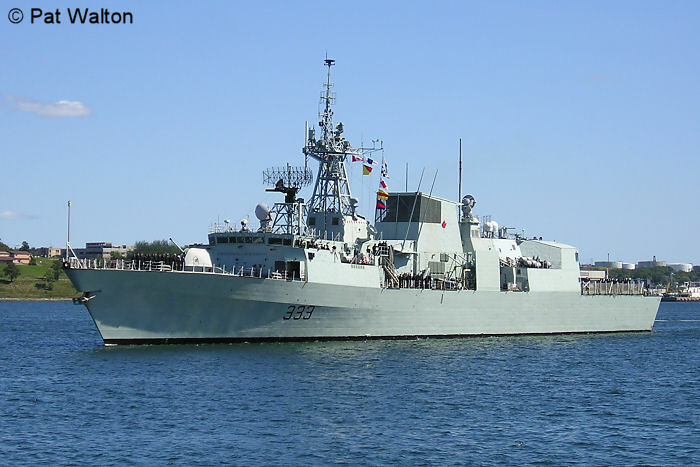 Although large ships, they were designed with a low profile and a reduced radar signature, which results from sloping many vertical surfaces away from the vertical. 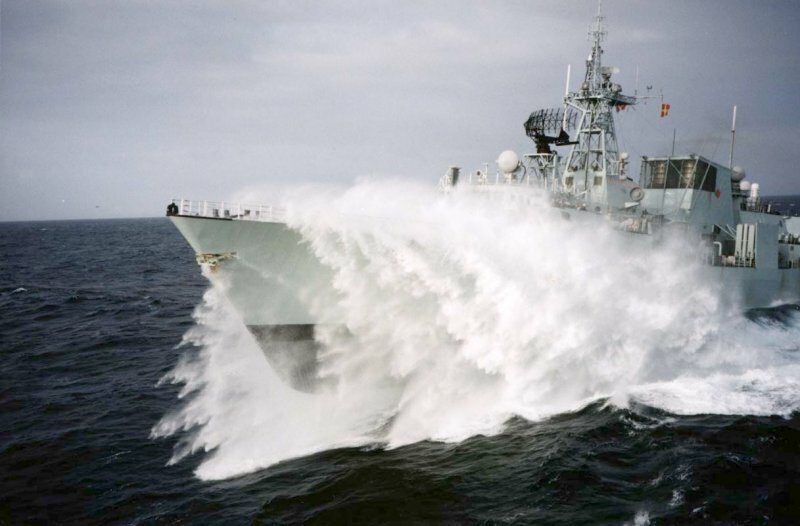 Engines are raft mounted to reduce noise transmission to the hull, and extensive heat emissions reduction has resulted in a low heat signature. 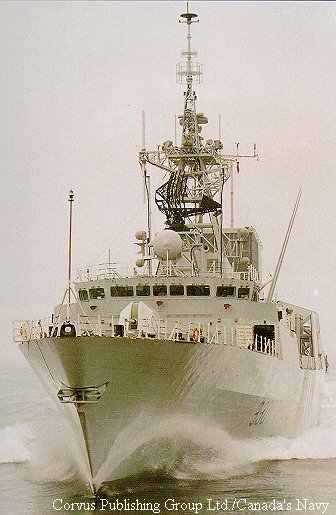 A single diesel engine provides economical cruising propulsion, while two GE LM2500 gas turbines (basically jet engines) provide sprint speeds in excess of 28 knots. 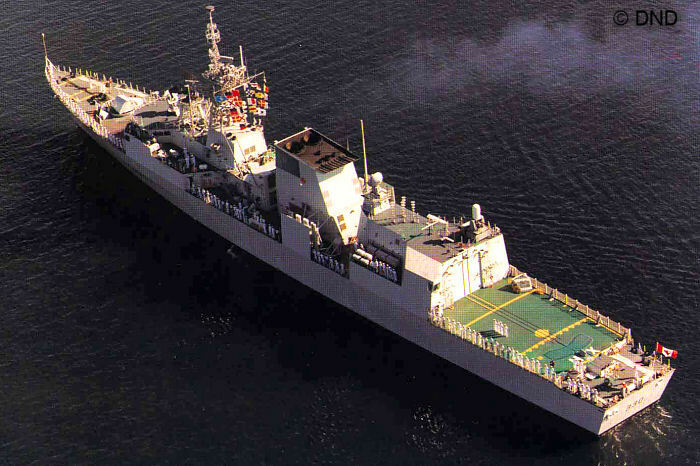 Although principally designed for ASW (anti-submarine warfare) with good sonars and Mk.46 torpedoes (both ship- and helicopter-launched), these ships carry a good balance of weapons giving them anti-surface (Harpoon and the 57mm gun) as well as anti-aircraft self defence (Sea Sparrow, 57mm gun, and Phalanx CIWS) capabilities. 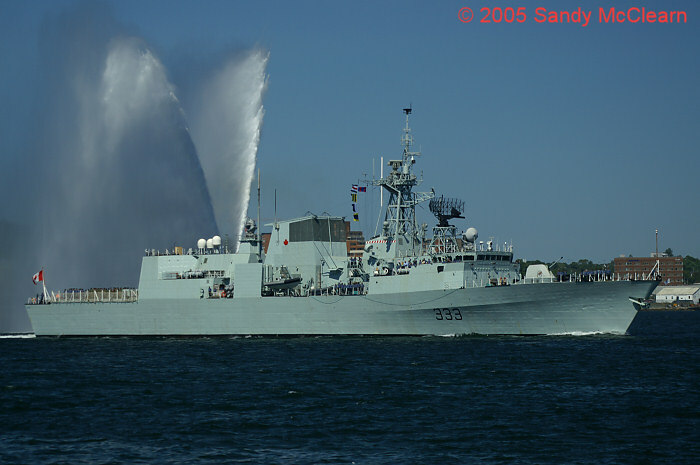 The weapons are coupled with good sensor systems in the form of the SQS 510 hull mounted sonar, SQR 19 towed array sonar with CANTASS computer processors, SPS 49 long range air search radar, and the Sea Giraffe air/surface search radar system. These ships also continue the Canadian tradition of operating large helicopters from small decks, and are fitted with the Canadian developed Beartrap (RAST in USN parlance) helicopter haul-down system which allows Sea Kings to take-off and land from these ships in most weather conditions. 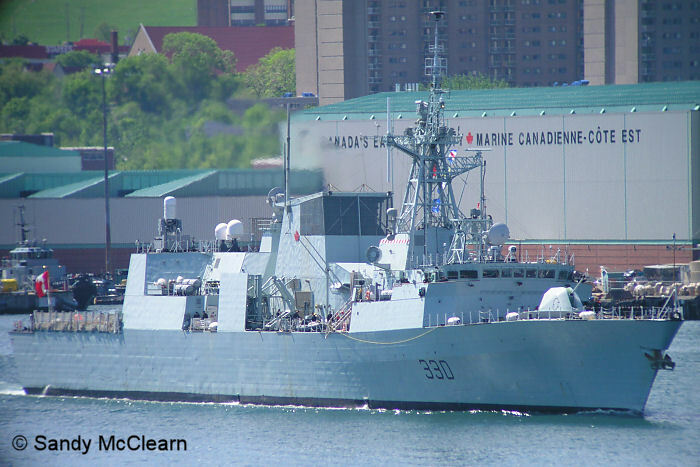 Around 1998, HMCS MONTREAL came out of refit with new propellors and anechoic tiles on the hull in an attempt to further reduce radiated noise levels. 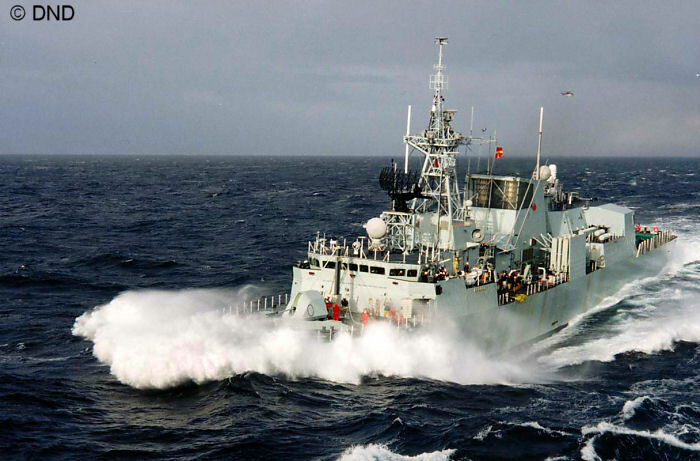 The whole class was originally fitted with the Prairie Masker system, which released air bubbles from the hull around noise-generating regions of the ship; these systems were deactivated when the Navy determined that the operating costs of this system outweighed the benefits. 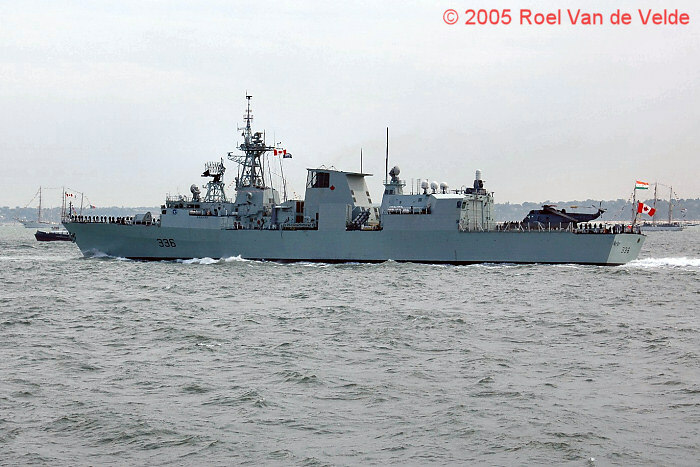 Jane's Fighting Ships reported that the whole class was to receive Towed Integrated Active/Passive Sonar (TIAPS) starting in 2002, although this does not appear to have come to pass. 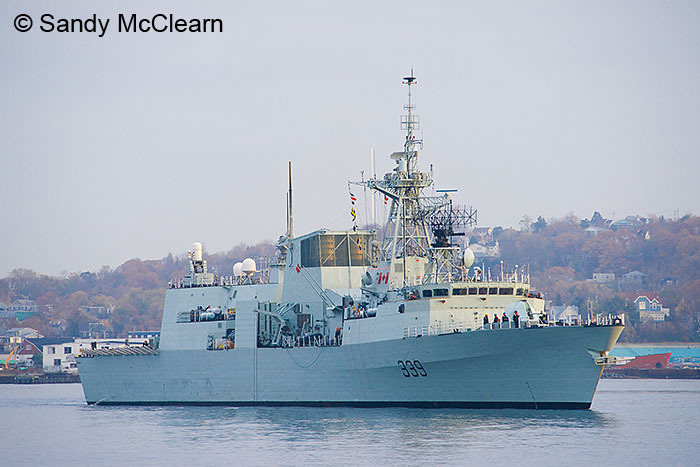 The Phalanx CIWS (Close-In Weapons System) has been upgraded to Mod 1B, which upgrades the radar system and adds an infrared camera to allow for capability against small surface targets. Evolved Sea Sparrow Missile (surface to air) ESSM. Replacement of the Navigation Radar. The Sea King helicopter is to be replaced with the Sikorsky H-92 Cyclone in the coming years. 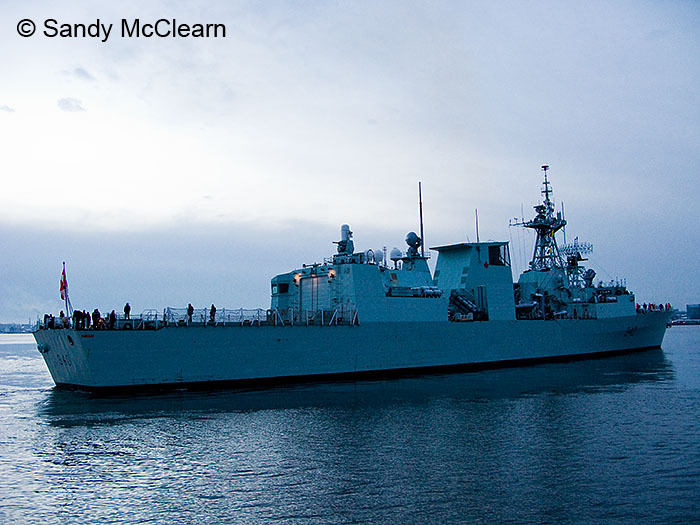 Take a photographic tour of a HALIFAX class frigate. Click on the thumbnail to load a larger image. Photos by Sandy McClearn unless noted otherwise. 2. 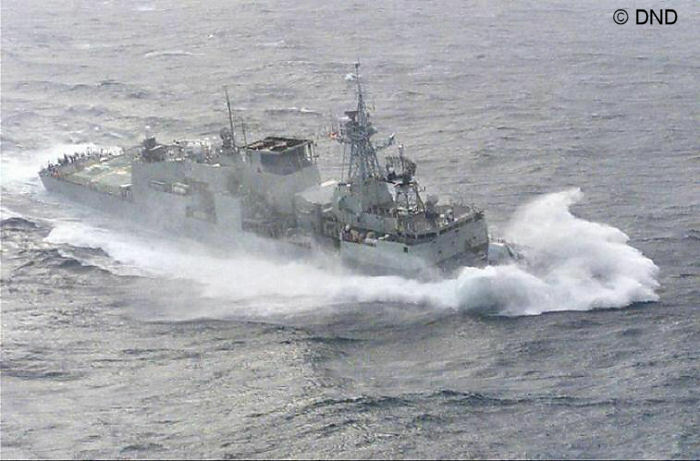 HALIFAX during sea trials in the early 1990s, shown here cruising at high speed. Saint John Ship Building photo. 3. 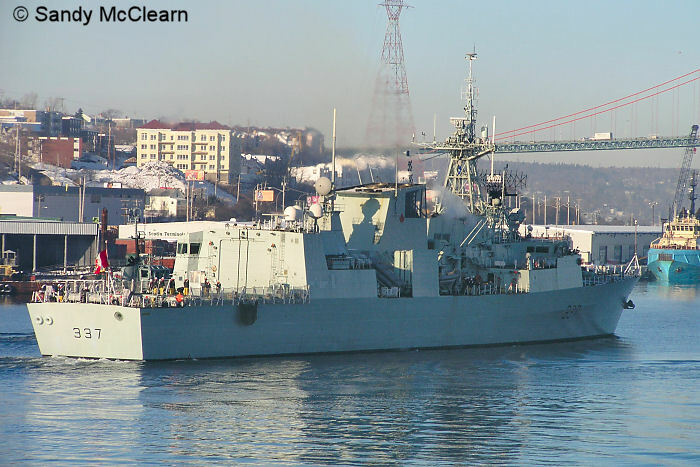 Transiting the narrows of Halifax Harbour. Sandy McClearn photo. 4. Anchored in the main harbour. Sandy McClearn photo. 5. 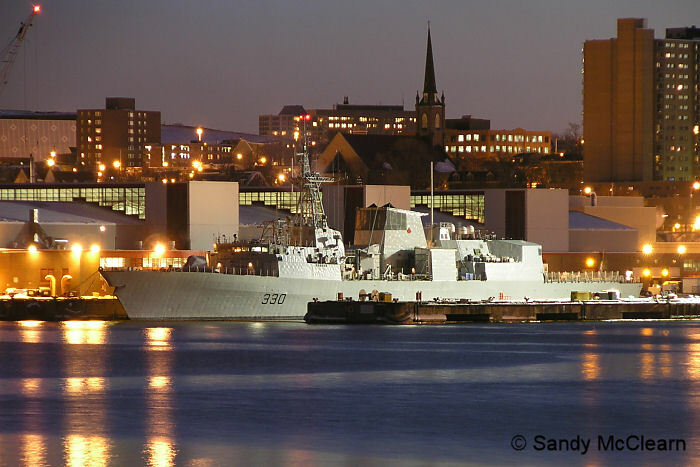 HALIFAX lies alongside at night. Sandy McClearn photo. 8. 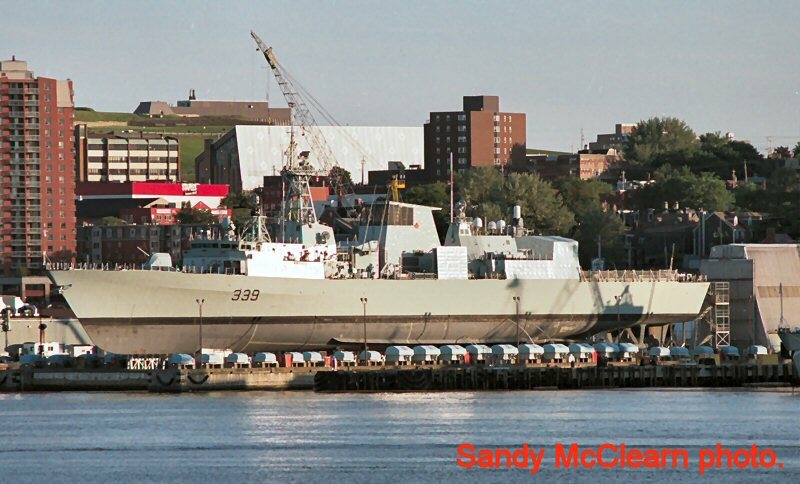 This early photo of HALIFAX shows fewer antennas and topside clutter. DND photo. 9. 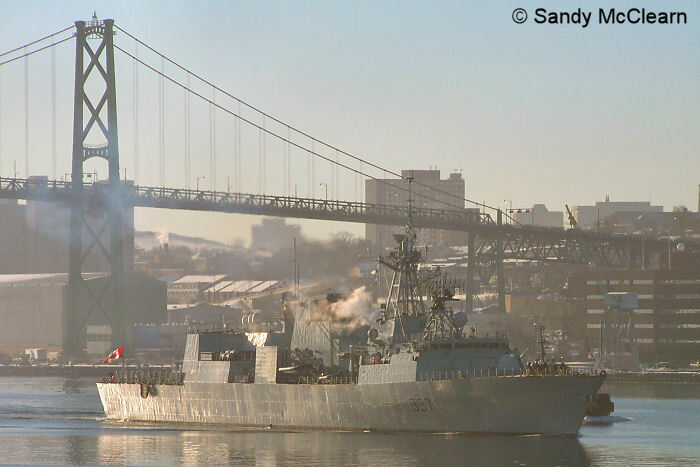 A slight mist is on the water as HALIFAX passes HMCS PRESERVER, in refit at the Halifax Shipyard. 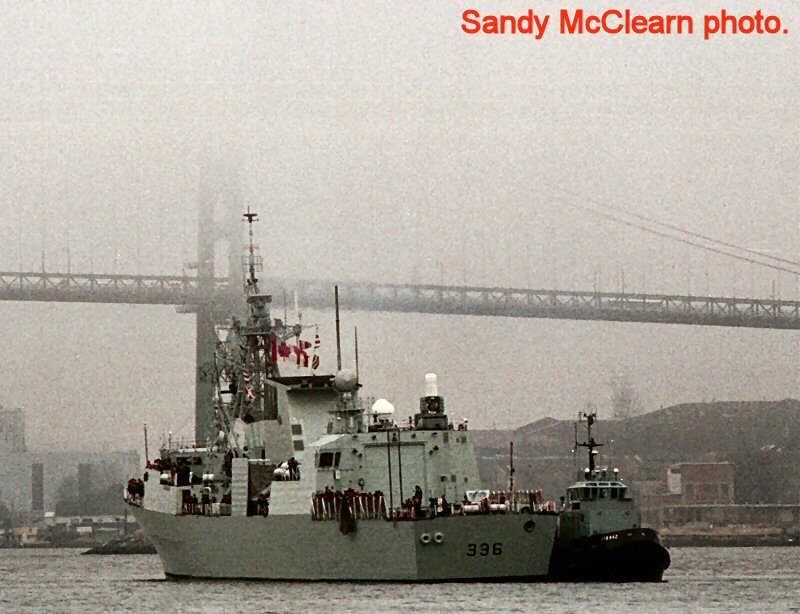 Sandy McClearn photo. 10. 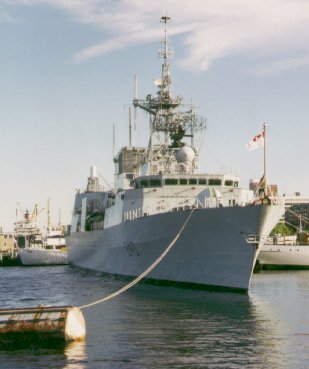 Halifax. (2007) Sandy McClearn photo. 1. 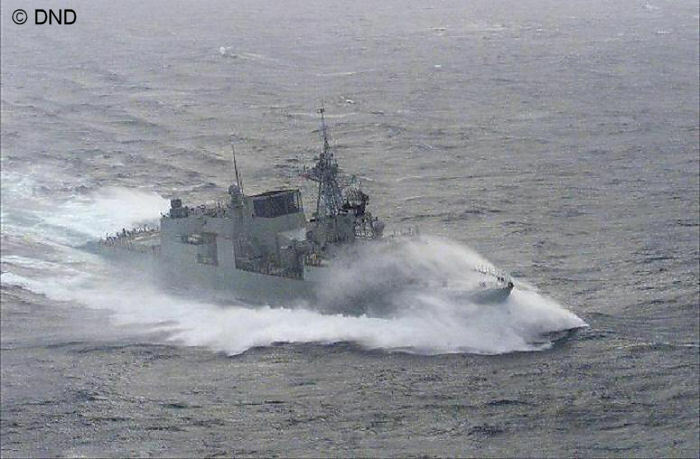 VANCOUVER at sea. DND photo / Cpl. Charles Barber. 2. VANCOUVER enters port. DND photo / Cpl. Colin Kenney. 2. 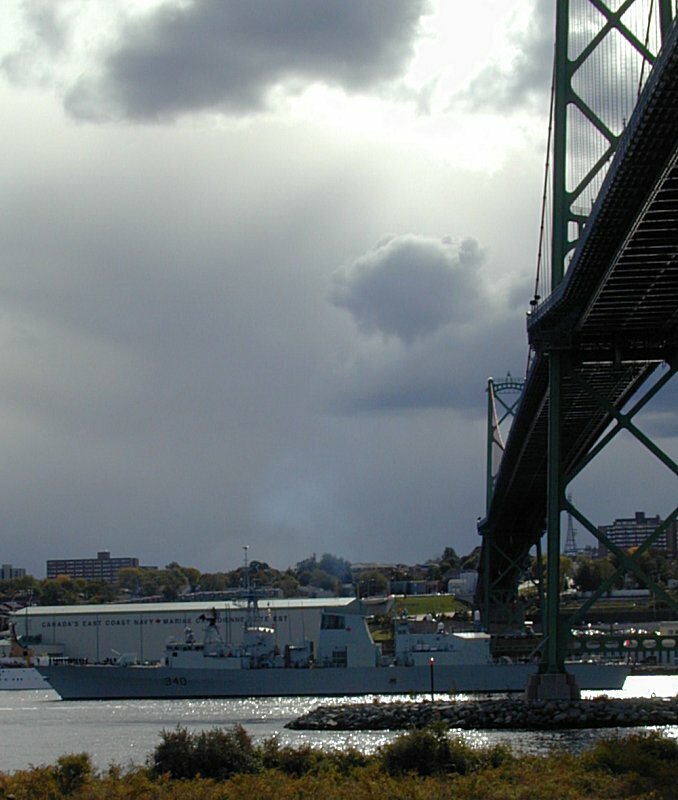 VILLE DE QUEBEC is towed to the Magazine Wharf. Sandy McClearn photo. 4. 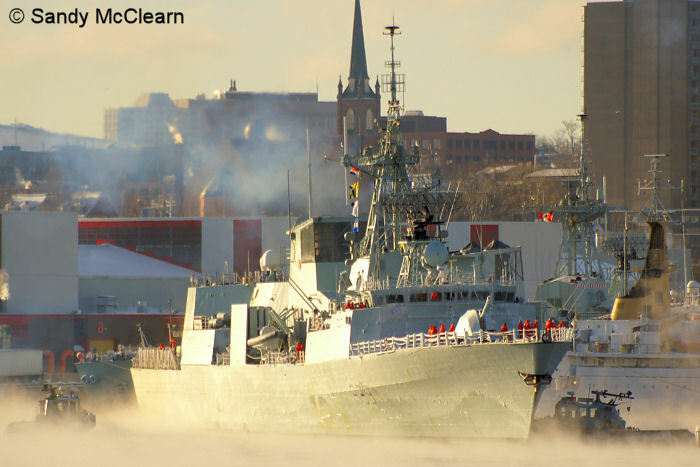 VILLE DE QUEBEC is towed through a thick sea smoke in Halifax Harbour. Sandy McClearn photo. 6. 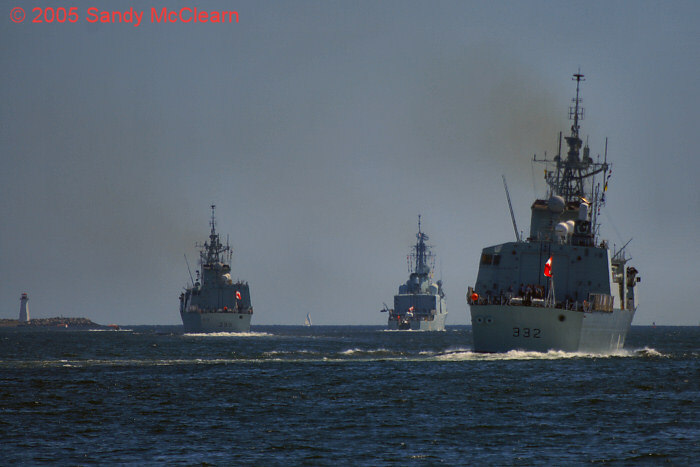 From right to left, HMC Ships VILLE DE QUEBEC, ATHABASKAN, and TORONTO depart for Operation Unison. Sandy McClearn photo. 7. 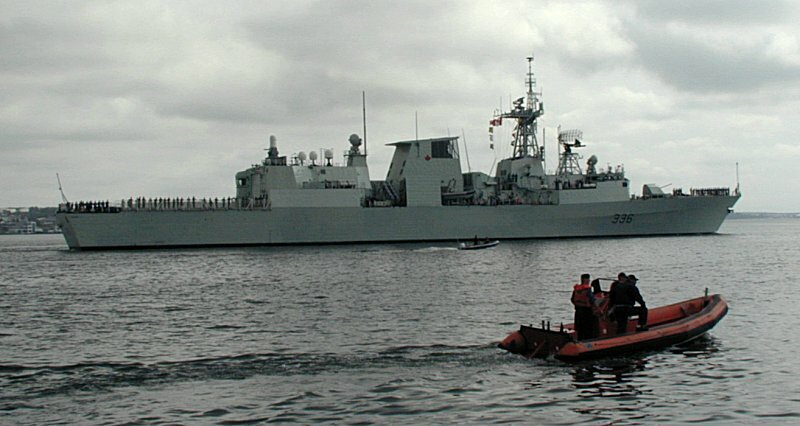 A personnel transfer from VILLE DE QUEBEC. (2008) Sandy McClearn photo. 4. 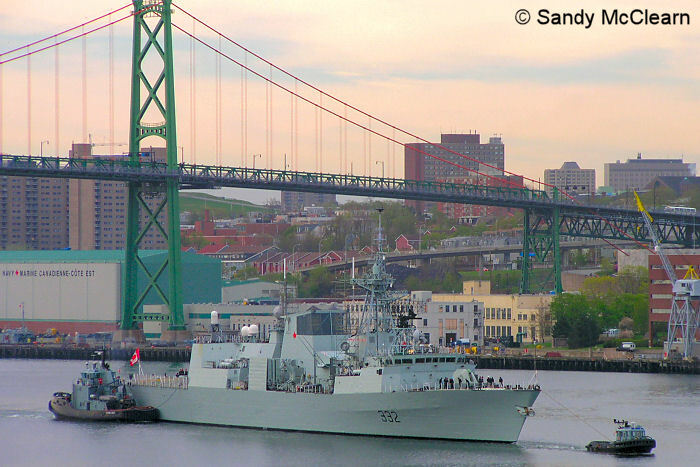 TORONTO passes by the drydock of the Halifax Shipyard. Sandy McClearn photo. 5. 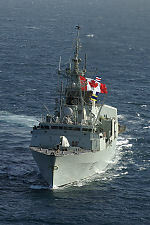 TORONTO flies her large Sunday pennant in the Northern Arabian Gulf. 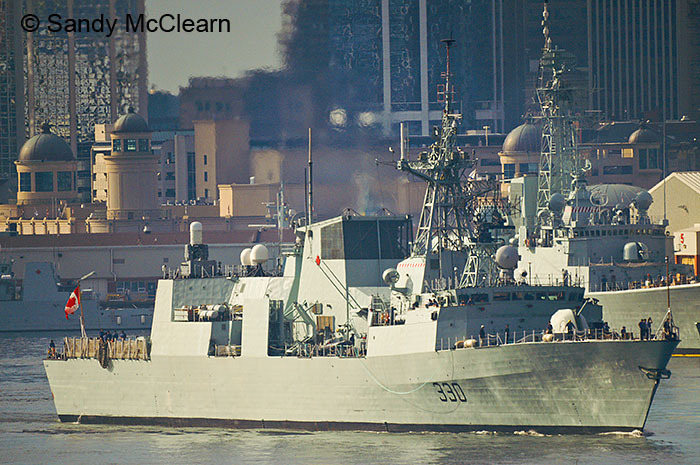 DND photo / MCpl. Colin Kenney. 6. 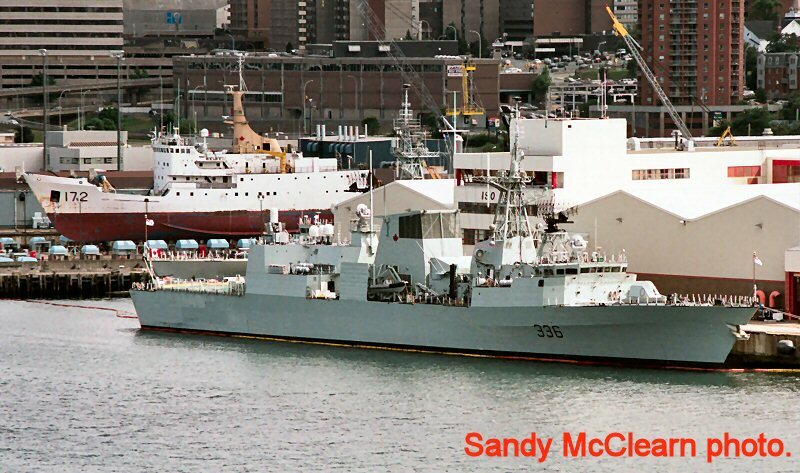 TORONTO in Halifax Harbour. Pat Walton photo. 8. 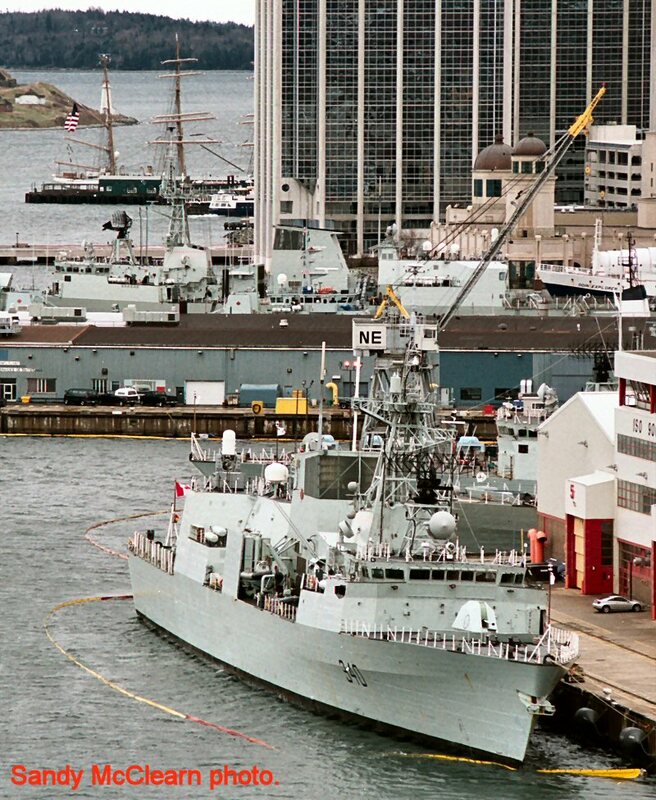 TORONTO departs for Operation Unison. Sandy McClearn photo. 1. 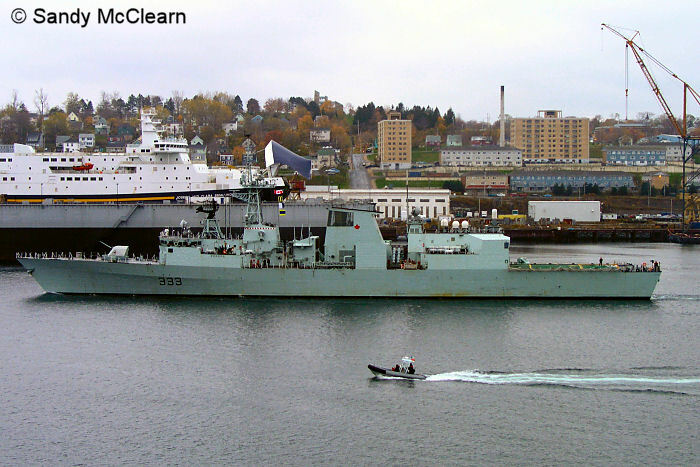 REGINA pulls alongside HMCS PROTECTEUR in the Pacific. DND photo / Cpl. Charles Barber. 2. 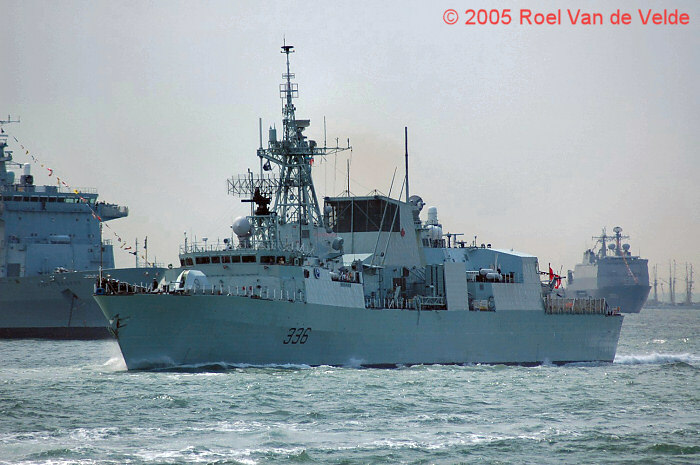 REGINA in the Gulf of Oman, as a part of Task Force 151. 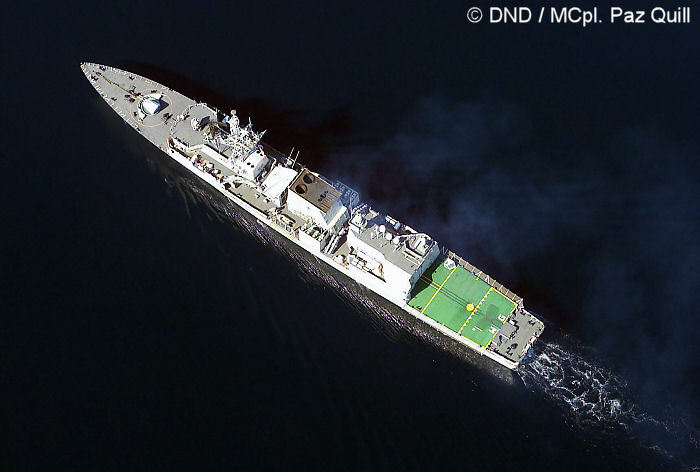 DND photo / MCpl. Frank Hudec. 1. 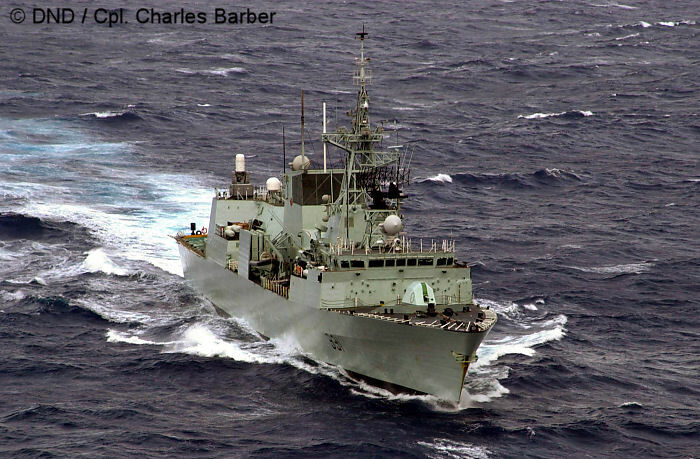 HMCS CALGARY at sea. DND Photo. 1. 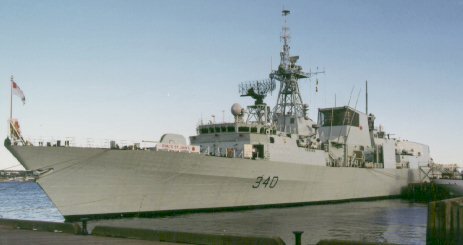 MONTREAL returns from Operation Apollo. (April 2003) Sandy McClearn photo. 2. MONTREAL. (May 2003) Sandy McClearn photo. 3. 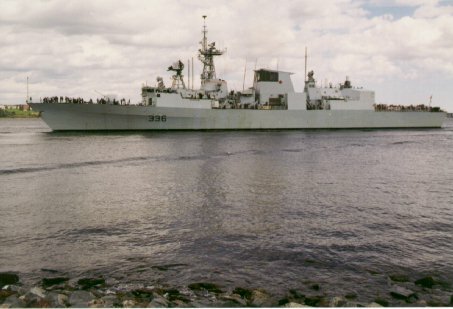 MONTREAL at sea in this undated photo. 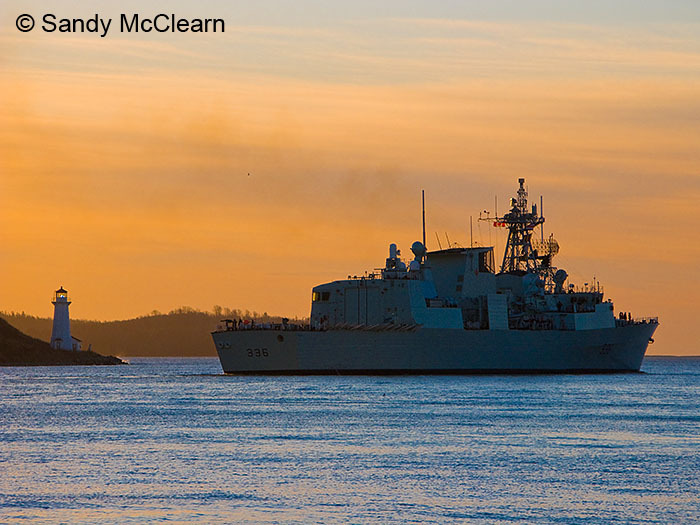 DND photo, courtesy of HMCS MONTREAL. 4. 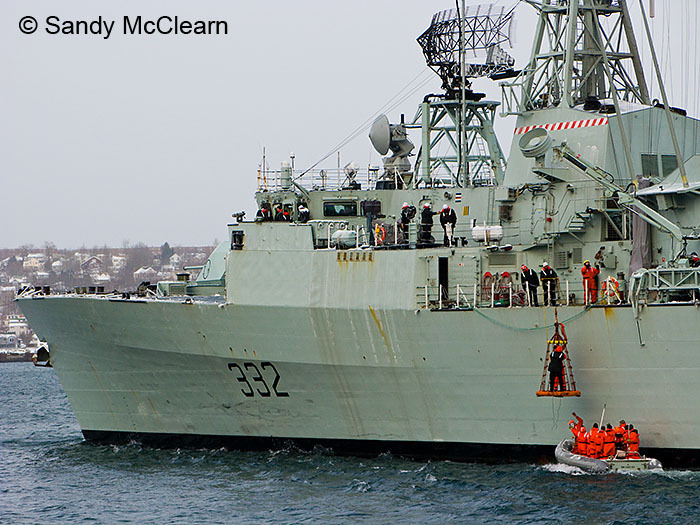 A RHIB passes in front of the camera as MONTREAL leaves for Operation Apollo. (2002) Sandy McClearn photo. 5. 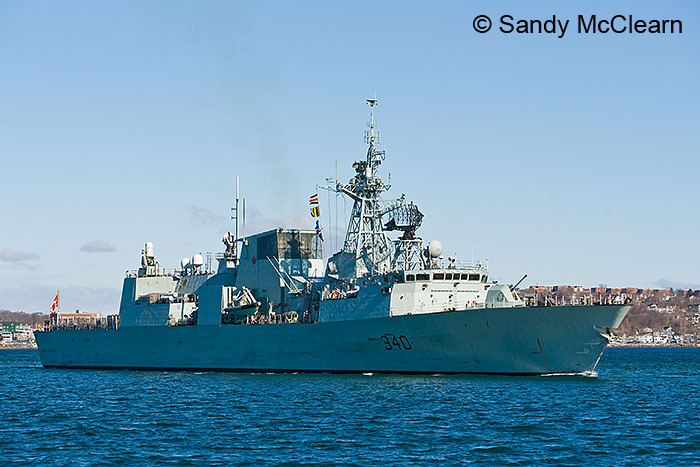 HMCS MONTREAL departs Halifax for Operation Apollo in the Northern Arabian Sea. (2002) Sandy McClearn photo. 6. 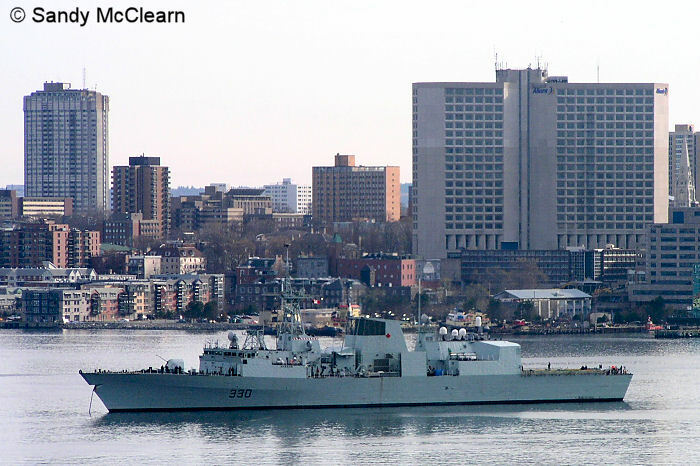 HMCS MONTREAL in Halifax Harbour. ('96) Sandy McClearn photo. 9. 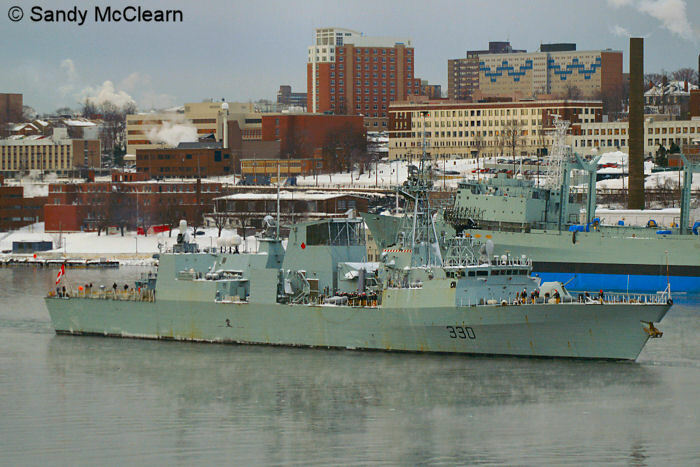 MONTREAL in Halifax Harbour. (2007) Sandy McClearn photo. 10. 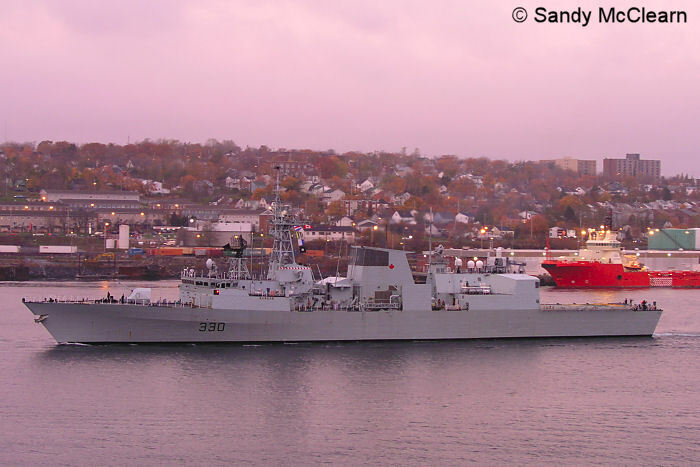 MONTREAL in Halifax Harbour at sunrise. (2007) Sandy McClearn photo. 1. 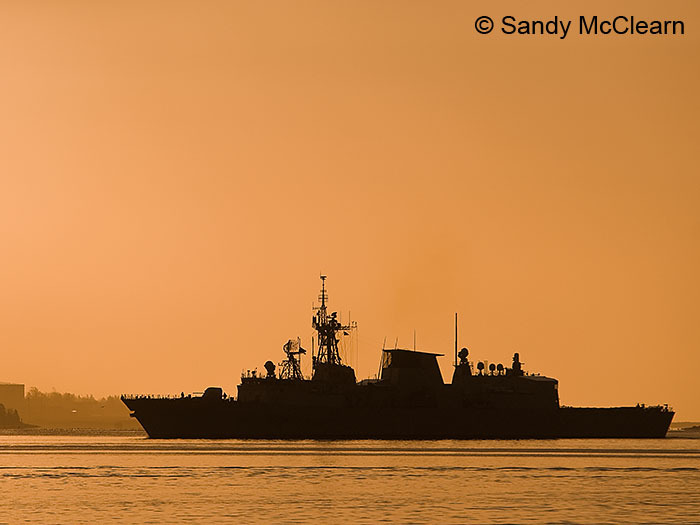 FREDERICTON, shown near George's Island, is silhouetted against the dawn sky while entering Halifax Harbour early one morning during the summer of 1997. 2. 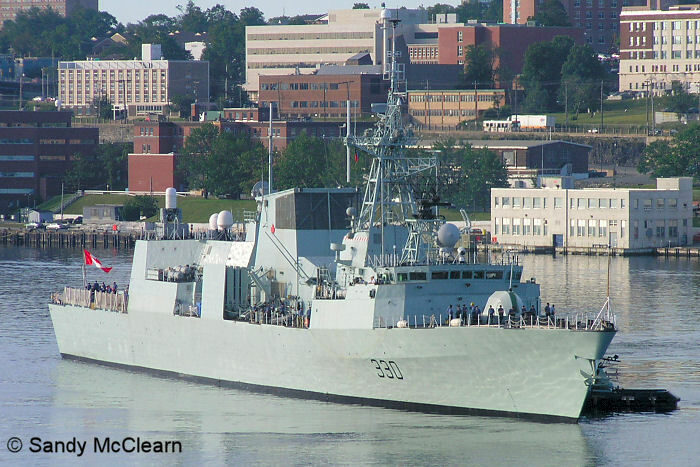 FREDERICTON. Sandy McClearn photo. 3. 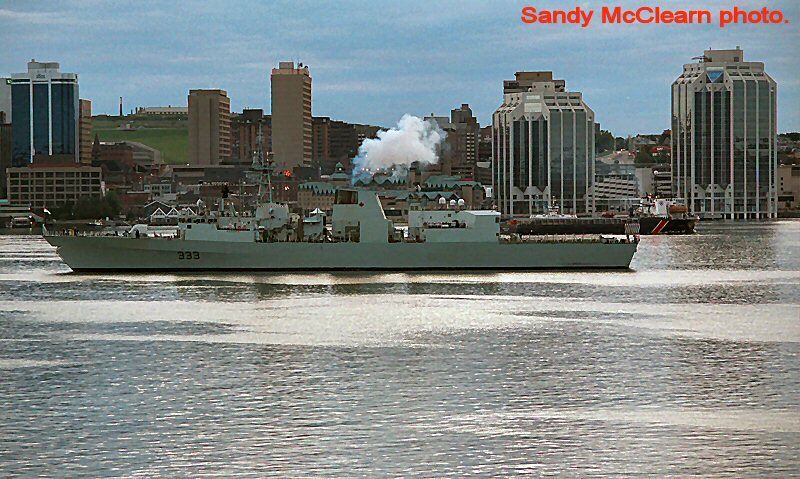 FREDERICTON in the narrows of Halifax Harbour. Sandy McClearn photo. 5 to 8. 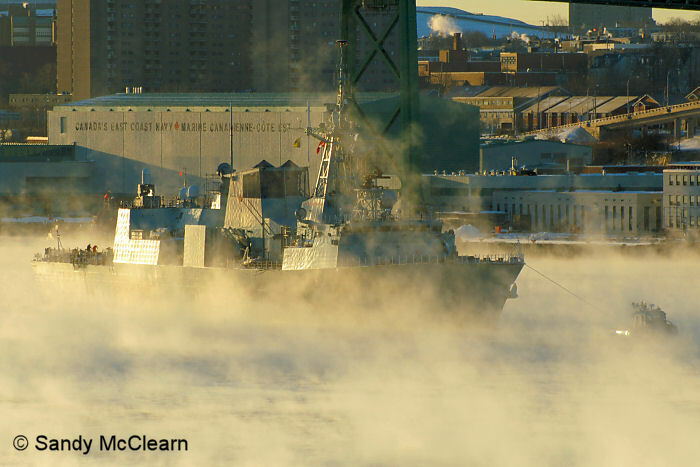 FREDERICTON kicks up spray in freezing conditions, causing ice to build up on her superstructure. 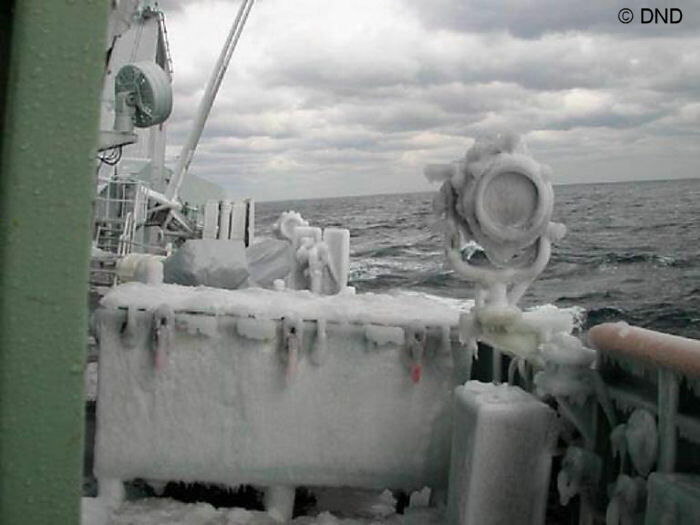 When too much ice builds up on a ship, it can begin to affect stability and even cause the ship to capsize. DND photos. 1. 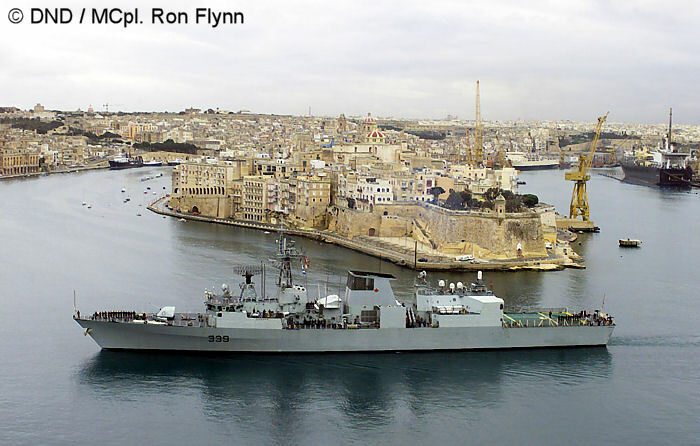 An aerial view of WINNIPEG, taken from the ship's helicopter in the Gulf of Oman. 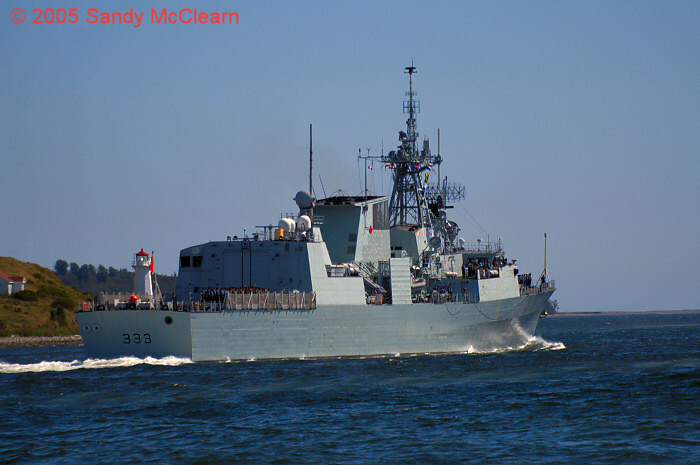 DND photo / MCpl. Paz Quill. 2. 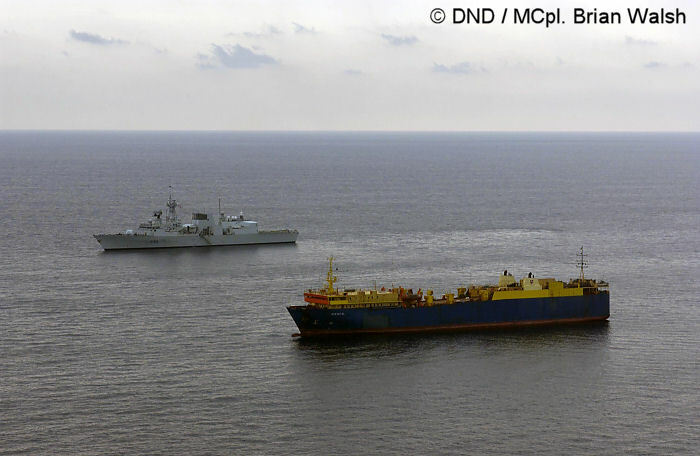 WINNIPEG approaches a ship in the Gulf of Oman, and sends over it's boarding team to inspect the ship and its cargo. 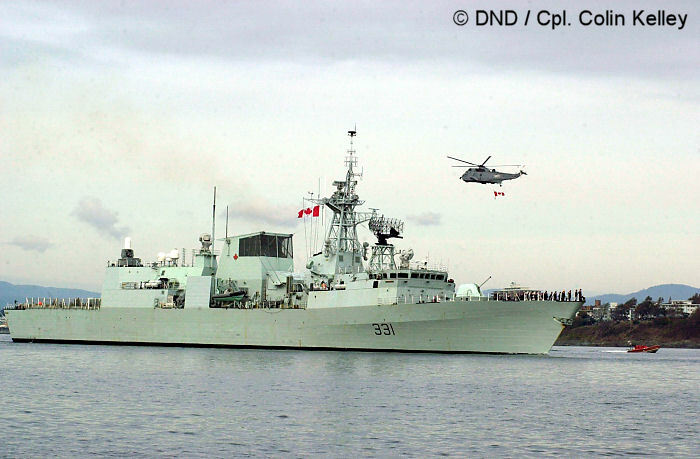 DND photo / MCpl. Brian Walsh. 5. Grand Harbour, Malta. 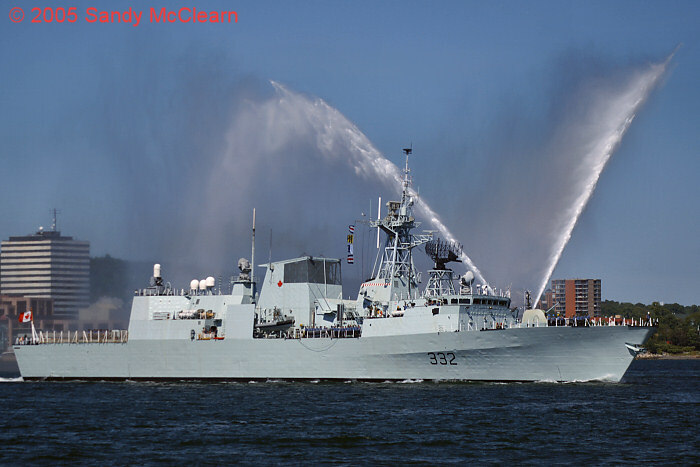 DND photo / MCpl Ron Flynn. 8. CHARLOTTETOWN at sunrise. (2008) Sandy McClearn photo. 9. 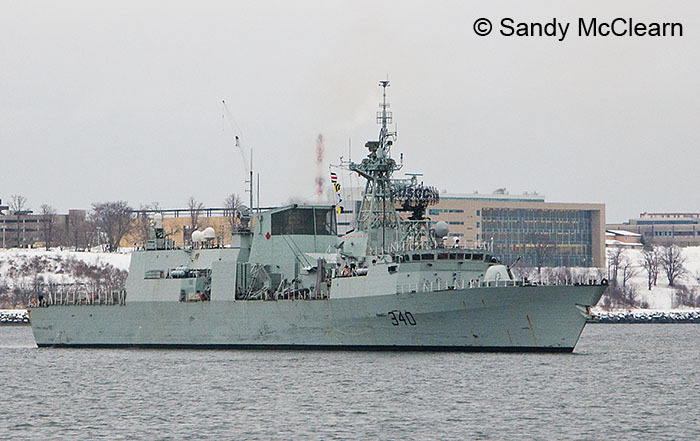 CHARLOTTETOWN in Halifax Harbour. (2008) Sandy McClearn photo. 3 to 5. 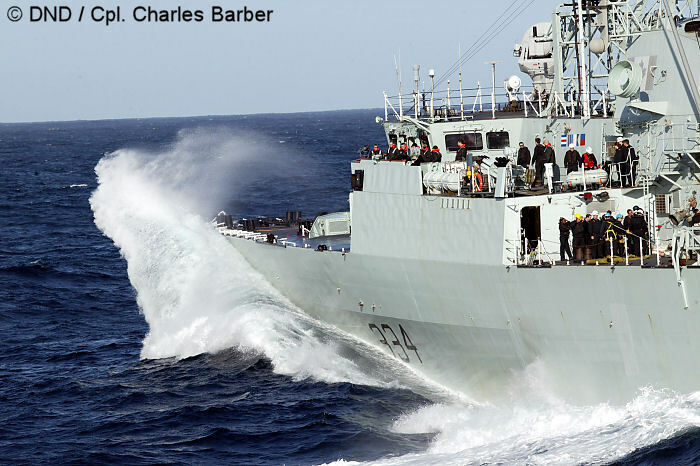 A sequence of ST. JOHN'S as she shoulders into a wave and then lifts her bow out of the water in a heavy swell, as she approaches HMCS PRESERVER for refuelling. DND Photos, Courtesy of Anthony and John Floyd. 9. 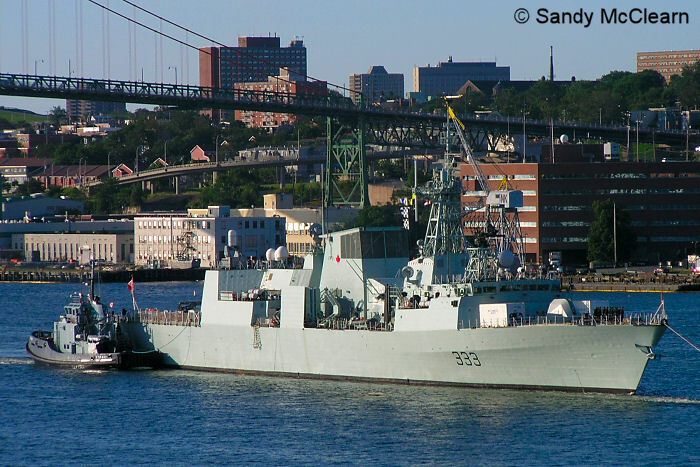 ST. JOHN'S in Halifax Harbour. (2008) Sandy McClearn photo. 10. 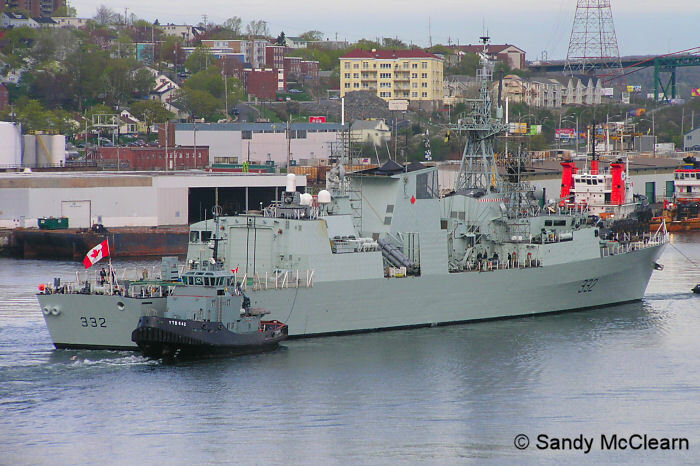 ST. JOHN'S in Halifax Harbour. (2009) Sandy McClearn photo. 11. 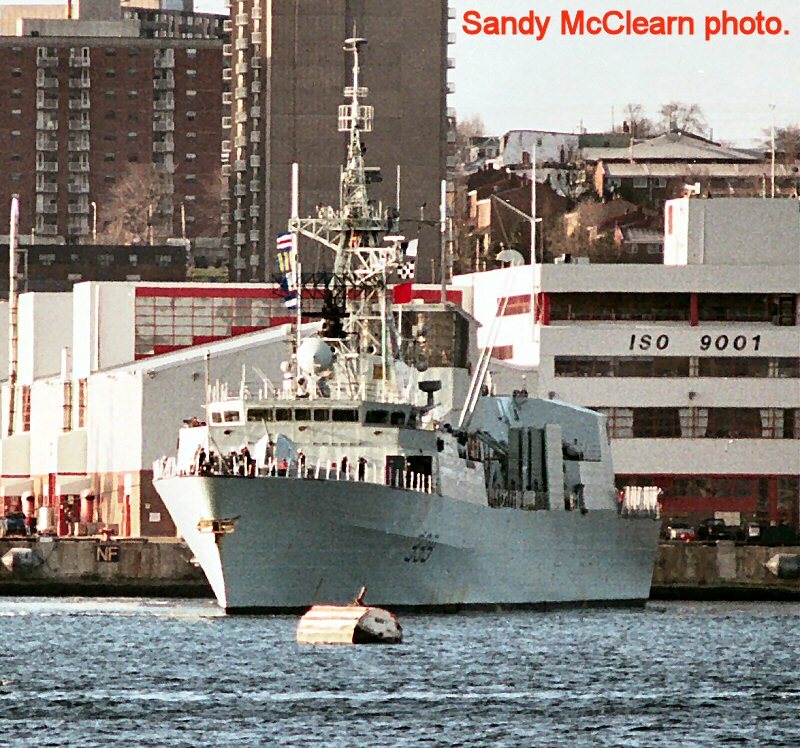 ST. JOHN'S in Halifax Harbour. (2007) Sandy McClearn photo. 1. 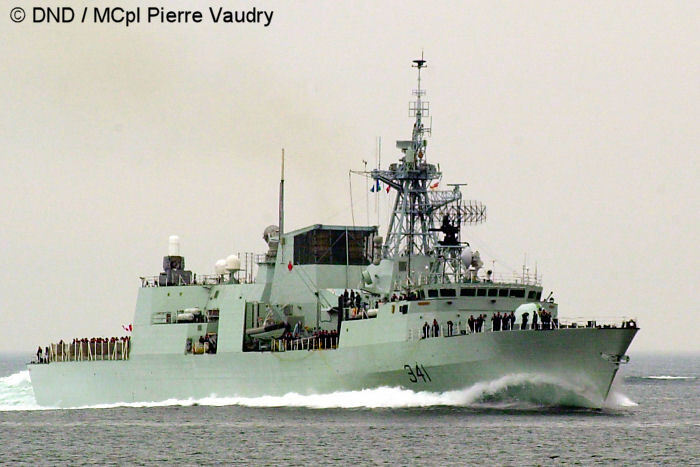 OTTAWA at speed. 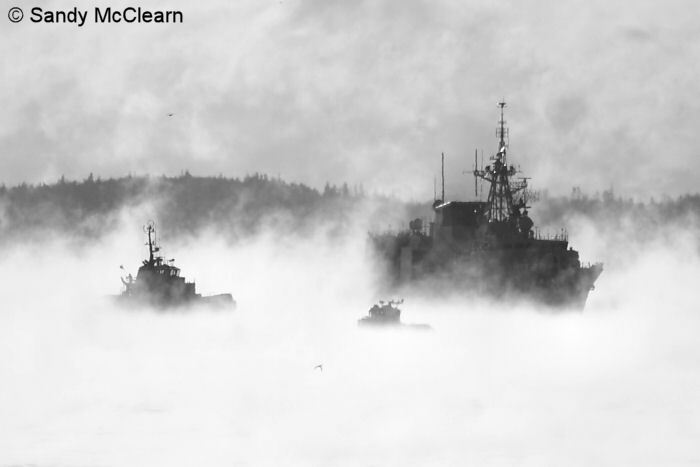 DND photo / MCpl. Pierre Vaudry. 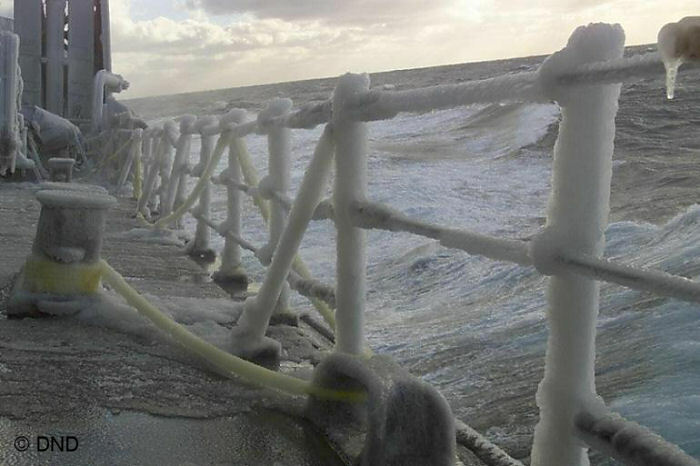 This section of the HG&UWsite created and maintained by Sandy McClearn . Copyright © 1997-2009, Sandy McClearn. All Rights Reserved.